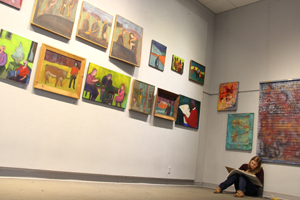 Art is offered as a degree program leading to the Bachelor of Arts in Art. The Art Program at Castleton, while being a strongly humanistic course of study in which students develop skills in creative and critical thinking along with aesthetic and historical appreciation, is structured to provide art majors the opportunity to prepare for careers in Studio Art, Art History, Graphic Design, Art Education, or Photography. Departmental trips to New York City galleries and museums bring students in contact with original historic and contemporary works of art. Many galleries and museums, such as the Hood Museum, the Williams College Museum, the Clark Museum, Mass MOCA, the Middlebury College Museum, and the Fleming Museum are within easy reach of the campus. The Art Students League, a campus club, sponsors visiting artists, film series, studio visits, and collaborative projects as well as trips. Graduates of the art program have worked in graphic design studios and started graphic design and other art production businesses, worked in museums and galleries, entered Master of Fine Arts and other degree programs and, in conjunction with coursework in education, gained licensure and taught art in elementary and secondary schools in Vermont and other states. An understanding of the process of making art. A personal context and direction in studio work.